Until last Friday I had never fished for Muskie. Nor had my fishing buddy Tom. But hey,our wives, had given us a trip for Christmas and our friends at Mad River Outfitters convinced us that we could get a shot if we headed to southeast Ohio with ten weight rods, sinking lines, and large pink flys. Up at 3am, on the road at 4am, parked in the Walmart parking lot at 7. After passing up some muddy water from yesterday’s rain we pulled in to a grass ramp and launched the ClackaCraft. 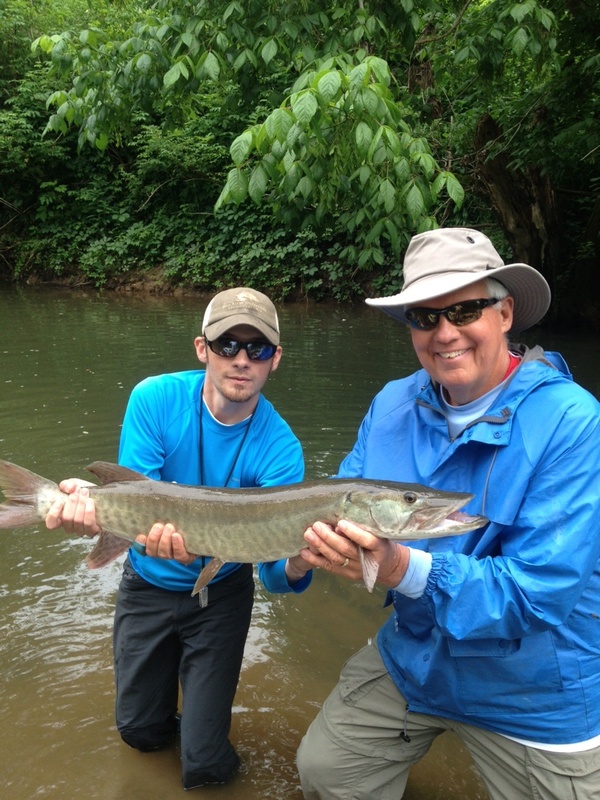 Our guide, Pat, slowly rowed us down the Little Muskingum river and we began to cast or should I say flog away. After about an hour, we floated around a bend and to the right above us on the bank were three empty lawn chairs surrounded by beer cans. My mind drifted back to my youth when my Grandpa Hessey and I would sit on the banks of the Fostoria Ohio reservoirs with cane poles, minnows, and round red bobbers. When that bobber would go down I would yank white crappies up, out, over my head, and onto the bank behind. And we would laugh! I told my boat mates the story. They were not interested but Pat gently brought me back to reality and suggested that I should cast beyond a log which was running diagonally from the bank. The fly landed about a foot beyond the log. One strip and then chaos. A Muskie garbaged the fly and then launched itself in a four foot jump. Pat screamed to get the fish up and over the log but I was not tight on the fish. It seemed like 20 seconds before I got tight and set with a strip strike. Tom said later that it only took a couple of seconds to set but I am not sure. Pat shouted at least twenty different commands pretty sure I followed no more than two of them. Once we got the fish over the log it felt like we might get him. And after a few anxious moments with the net he was next to the boat. We went crazy! I confess that only Rowe Luck brought that fish to the boat. I really was in a fog. Pat had such an adrenalin rush that the blood ran from his face and he leaned over the side of the boat concerned that he would lose his breakfast. First Muskie 33 inches. To be honest, I am pretty sure that Grandpa Hessey’s spirit was in that lawn chair and while he puffed the familiar King Edwards cigar decided to send a hungry Muskie to visit his grateful grandson. Grandpa, thanks for the Muskie and the first cane pole! This entry was posted in Fishing Stories and tagged Mad River Outfitters, Muskie by Tarpon Slam. Bookmark the permalink.